Welcome to the Home page of the Web Site of the Volunteers of Lightship #116-538. We update different parts of this site monthly, so check back often. The list of events is updated every few weeks. This little known gem of Chesapeake Bay history was the last active floating lighthouse, or Lightship, that was stationed in or near the Chesapeake Bay. The 2019 volunteer work days are now posted on the Events and Volunteering page. The revised patch with DELAWARE is completed and in hand. 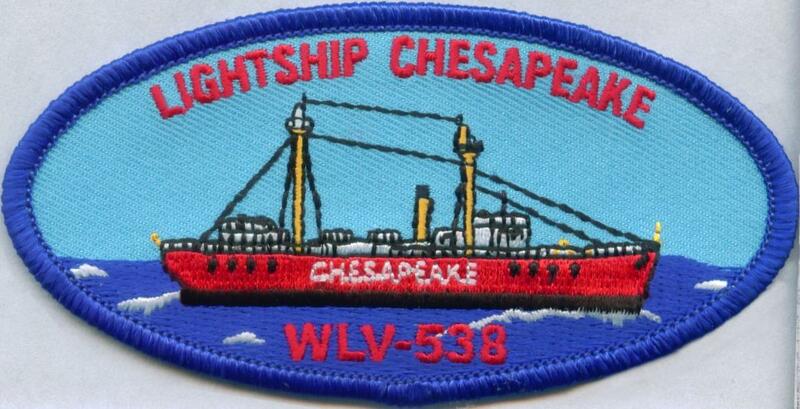 If you are a former crew member of WLV-538 when it was marked DELAWARE, send me an email at crew@lightship116-538.org and let me know if you would like one, on us. The lightship patch is available on the Volunteer work days. The ship is moored to Pier 3 in Baltimore Inner Harbor, right next to the Submarine Torsk and the aquarium. It is open for visiting with a paid admission to the Historic Ships In Baltimore museum, which was formed by the merger of the Baltimore Maritime Museum and USS Constellation Museum in 2009. Check the HSIB museum web site in our links page for times the museum is open and any discounts for military personnel. The HSIB Museum also maintains the Seven Foot Knolls Lighthouse and Coast Guard Cutter Taney on Pier 5 and the USS Constellation on Pier 1, in addition to the Lightship and Submarine on Pier 3. Both the Lightship and Lighthouse participate in the US Lighthouse Society Passport program, so ink stamps for each are available at the entrance to both. Just ask the museum staff member on duty. USLHS Passport books can be purchased on the USLHS web site HERE . The Lightship passport stamp is shown to the right. This site is paid for and maintained by the Lightship volunteers and is not an official web site of the Historic Ships in Baltimore (HSIB) museum. 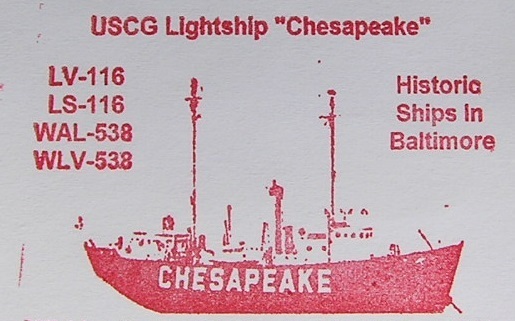 The USLHS Passport stamp for the Lightship CHESAPEAKE. If you visit and desire a stamp, ask the staff on board and if they say they can't find it please ask if any volunteers are on board and if not then ask them for the "Chief" of the day. It is ALWAYS on board!